If you ask CBS Entertainment president Kelly Kahl, he’ll tell you how he really feels about the upcoming end of “The Big Bang Theory,” which will wrap its 12-season run in May. The spinoff, which follows a younger version of Jim Parson’s Sheldon Cooper growing up in Texas, averaged north of 16 million viewers during its debut season, and was handed a two-season renewal last month, a vote of confidence that the series can become the new anchor for CBS’ comedy lineup. Kahl said no decision has been made just yet on whether “Young Sheldon” will inherit the “Big Bang” timeslot leading off Thursdays, but he’s bullish that it can be the same launchpad to lead into new series that “Big Bang” was for so many years. But replacing “Big Bang” will still be a Herculean task, as few series have mattered more to CBS. “I don’t think the show has gotten anywhere near the credit it deserves for how good it is,” Kahl said. During a set visit in February attended by TheWrap, the importance of the show was fully on display. There was Warner Bros. TV group president Peter Roth walking around the show’s sound stage – Stage 25 – at Warner Bros.’ Burbank studio. Roth was giving giant bear hugs to cast members including Kunal Nayyar (Rajesh Koothrappali), Johnny Galecki (Leonard Hofstadter), as well as series co-creator Chuck Lorre, as each walked by him. The cast and crew were getting ready to do the run-through for the episode titled, “The Conference Valuation,” which airs this Thursday. This was the first time they would go through the script on the set. The crew of roughly 50-60 people followed the cast around from scene to scene, huddling around as a stand-in for the studio audience, to help the actors know when to pause for laughs. 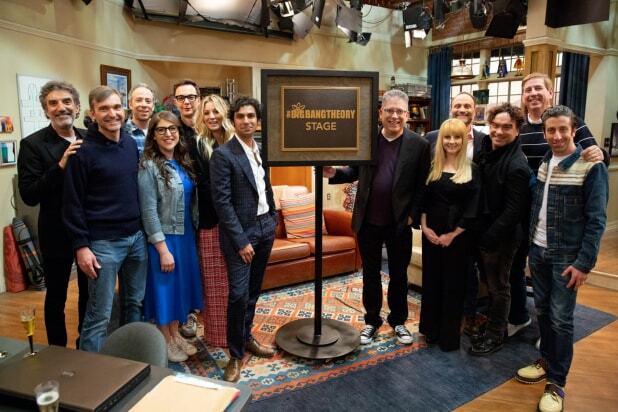 After the run-through, the cast and grew gathered so Roth could officially re-name the Stage 25 as “The Big Bang Theory Stage,” only the fifth time Warner Bros. has dedicated a specific studio (and the second time for Lorre, who experienced the same thing with “Two and a Half Men”). The room was filled with tears, hugs and everything else you could imagine from a group that’s spent the last 12 years together, which is a lifetime in the entertainment business. After drawing 8.3 million viewers for its first season — ranking No. 68 on TV — “The Big Bang Theory” added nearly 2 million viewers in season 2, moving up to No. 44. It would eventually average more than 20 million viewers by season 7, and was the most-viewed entertainment series during the 2017-2018 season with 18.9 million. Its final season currently is averaging 17.5 million viewers to maintain the top scripted spot on TV, according to the most recent numbers from Nielsen. Once considered a relic from an older TV era that was chock-full of multi-cam sitcoms like “Seinfeld,” “Frasier” and “Friends,” the multi-camera format is experiencing a renaissance that “The Big Bang Theory’s” longevity is now tied into. Currently, there are 11 multi-camera comedy pilots (with a few more hybrid splits of single/multi-cam) in contention for next season.